Redevelopment of Goddard House will bring 149 new residential apartments to Boston's Jamaica Plain neighborhood on a two-acre parcel overlooking the Emerald Necklace park. An existing former nursing home building built in the 1920s will be converted into 110 apartments; an addition will be built alongside the existing building. A second new building with 39 apartments will be built on site fronting South Huntington Avenue. Resident amenities at The Brynx will include a terrace, a fitness room, and a resident lounge. 65 resident vehicle parking spaces and 149 bicycle racks will be located on site. Renovations and the additions to the historic Goddard House along South Huntington Avenue in JP are nearing completion while interior work is ongoing for the new 6 story building being added to the project. In total, The Brynx will feature 149 apartments along with parking for 65 cars and 160 bikes. Resident amenities will include a roof terrace overlooking the Emerald Necklace and fitness center. The additions to the historic building, designed by Shepley Bulfinch, are meant to complement the original building while bracing the older structure to provide structural reinforcement. Construction is set to be complete in the spring. Eden Properties and Samuels & Associates, developers of the 149-unit Goddard House apartment development in Jamaica Plain, have closed on the acquisition of the two-acre project site at 201-205 South Huntington Avenue for $8.05 million and have secured $43.25 million of construction financing for the project through Northwestern Mutual Life Insurance Company. An existing 114,004-square-foot historic building which will be incorporated into the development stands on the site; the sale amounts to $70.61 per existing building square foot and $4.025 million per acre. The Goddard House project will now proceed with construction. Minor changes to the Goddard House development plan were approved at last Thursday (March 16th)’s Boston Planning & Development Agency (BPDA) Board Meeting. In light of the area’s geological constraints, the development’s footprint has been decreased slightly, decreasing the total residence count by 18 units; the development will now include 149 residences, down from 167. Likewise, total project square footage will decrease by 15,000 square feet, to 150,000 from 165,000. The Goddard House development was originally approved last year. Goddard House developer Eden Properties proposes minor changes to the approved development plan in light of the area’s geological constraints. Given the costs of excavation and shoring through rocks along South Huntington Avenue and required deep foundations at the site’s sloped rear, the developer proposes a slightly smaller footprint and increased setback from the Jamaicaway for the new building portion of the project. The adaptive reuse of the historic Goddard House building would remain unchanged. With the proposed changes, the total apartment residence count at Goddard House would decrease by 18 units, to 149 from 167. Total project square footage would likewise decrease by 15,000 square feet, to 150,000 from 165,000. Vehicle parking would decrease by 18 parking spaces, to 65 from 83. Bicycle storage would decrease by 18 racks, to 149 from 167. The previous Goddard House development plan was approved last year. The 167-unit Goddard House adaptive reuse residential apartment development located on South Huntington Avenue in Jamaica Plain has received all necessary approvals to move forward to construction, Prellwitz Chilinski Architects reports. The project has received approval from the Boston Planning and Development Agency, the Boston Zoning Board of Appeal, the Jamaica Plain Neighborhood Council and the Boston Parks & Recreation Department. 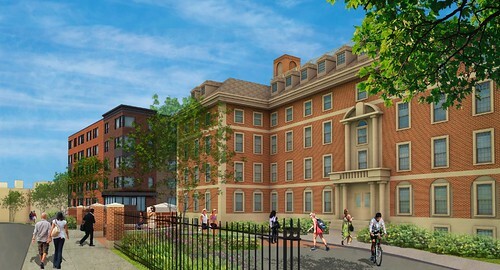 The Boston Redevelopment Authority approved the Goddard House project for construction at last night's board meeting. According to project principal Peter Sougarides, the project will break ground in early 2017 after securing additional permits, The Boston Globe reports. The Goddard House project joins a wave of new development along South Huntington Avenue in Boston's Jamaica Plain and Mission Hill neighborhoods. A mixed-use building at 35 South Huntington Avenue with 38 residential units and 7,080 square feet of retail was also approved for construction last night. Olmsted Place, a 196-unit residential building located next door to the Goddard House project, opened on November 1st. Serenity, a mixed-use building with 195 apartments and 2,100 square feet of retail, is currently under construction at 105 South Huntington Avenue.